I arrived at Malpensa Airport slightly after 8 am. I was expecting a much bigger crowd at the airport, but it seemed quiet. Air Serbia flight JU541 on 28th March was already announced for check-in at their usual counters in section 8. 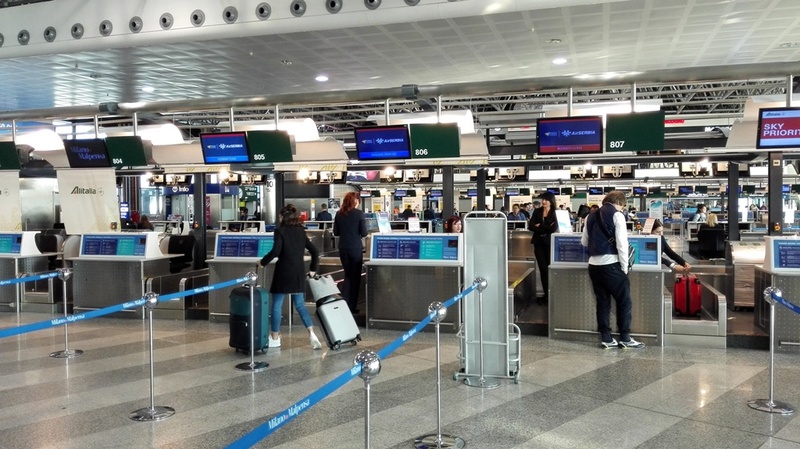 Three check-in counters were open, and just a couple of passengers in front of them. The Italian staff at the counter are quite friendly and talkative since there is no queue, so I took the opportunity to ask how many passengers there will be onboard the plane. She gave me the window seat and replied that there will be 98 passengers so she would give me an empty row. The same situation followed at the passport control. Just about 15 people in the line for non-EU passengers. 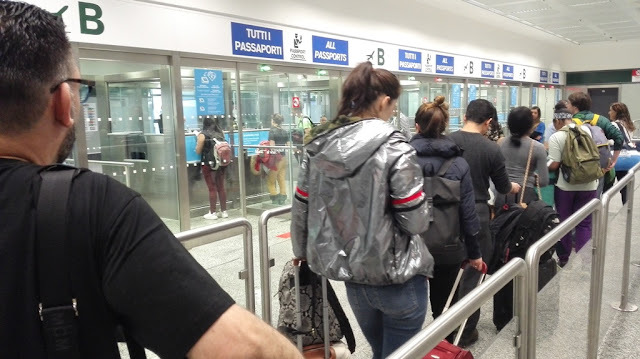 The policeman seemed indifferent, just scanned the passport, uttered with a semi-loud voice "Buon viaggio" and stamped the passport. Altogether, quite smooth and quick passage through Malpensa. 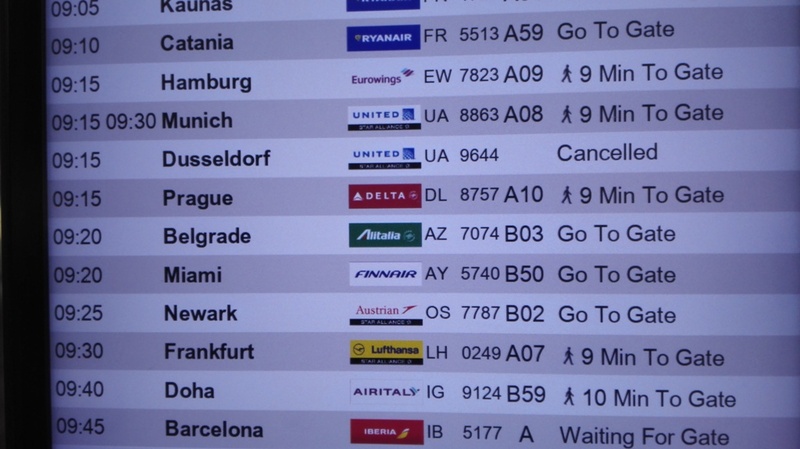 Meanwhile, I checked the screen with departures. 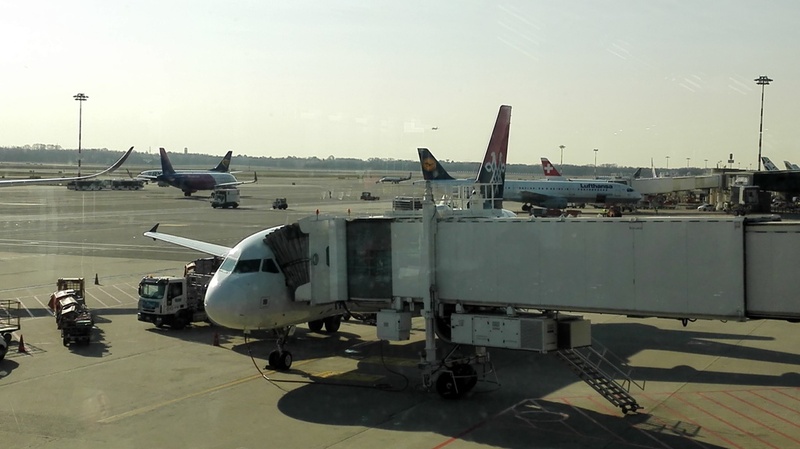 Flight to Belgrade was already announced at gate B3. Since I had enough time, I stopped for a drink at the nearby cafeteria. Exactly half an hour before departure time, they started boarding. Firstly, business class and Etihad premium passengers, then all others. Whilst boarding the plane, I noticed the entire waterpolo team of Jug from Dubrovnik. 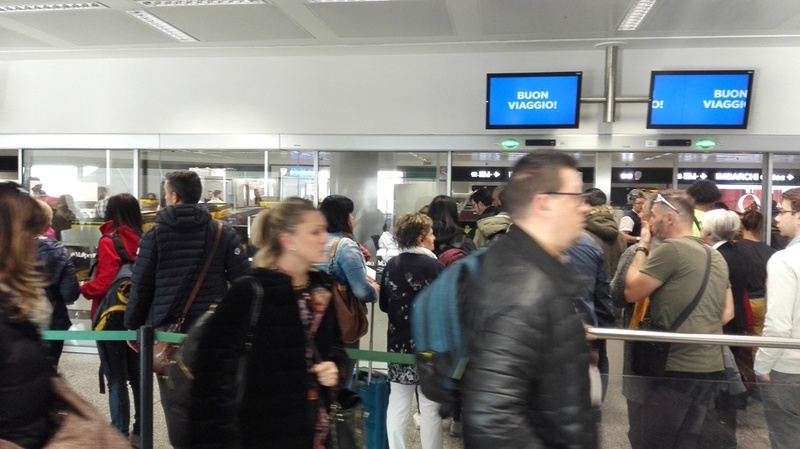 Hm, I know that they had a match the day before against BPM Sport Management in Busto Arsizio (Lombardy), but I was surprised to see them flying to Belgrade (knowing that flights to Dubrovnik haven't started yet). Boarding was completed, however, captain Živanović informed us that we were waiting for permission to taxi to the runway. After 15 minutes' delay, we finally departed. The flight was rather uneventful. Smooth journey, without turbulence. Sunny weather outside and a great view of the Croatian coast.. I had perfect conditions to start writing my new article about Italian wines for my wine blog - Vinopedia.rs. I spotted a special offer (a cup of coffee and a croissant for just 300 dinars in total), so ordered it in addition to regular 15 salty fish-shaped crackers and a bottle of water. I always check what kind of wine is served onboard a plane when I fly. 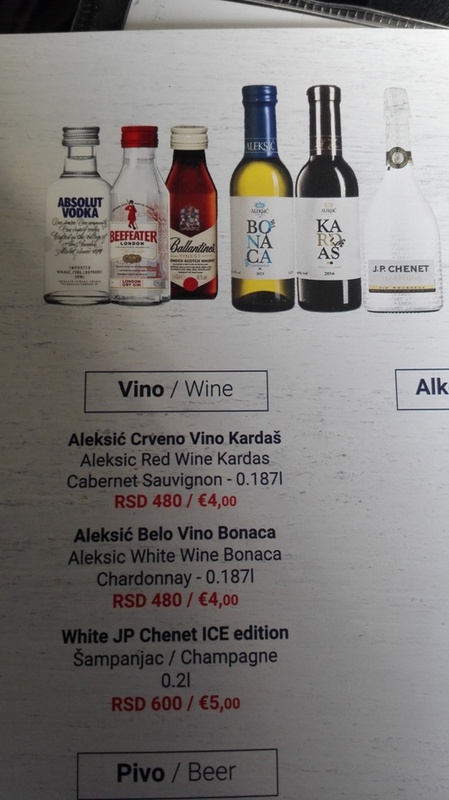 Air Serbia is offering red and white wines from Aleksić Winery in Vranje (South Serbia), whilst the sparkling is a French J.P. Chenet. I have to say that here I would always choose Serbian wine, as the quality/price ratio is much better than for the French mass-produced sparkling wine from lower supermarket shelves. 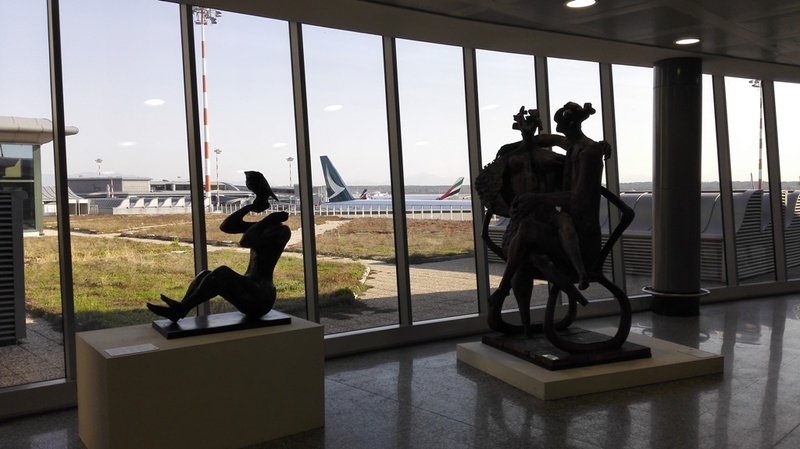 We arrived in Belgrade with 15 minutes' delay. Again, smooth passage through Nikola Tesla Airport. No queuing in front of passport control, the luggage arrived quite quickly. I noticed that those waterpolo players from Dubrovnik stayed in the transit zone, so it could be that they were continuing the trip to Tivat with Air Serbia (and then some bus shuttle to Dubrovnik, I guess)... Even the customs officers were not stalking passengers as they usually do. Altogether, quite a pleasant trip without much hassle. And back in Belgrade for 3 days, just in time to prepare for oncoming trip to Bordeaux next week. 68% LF is okay but could've been better. No competition on the route. I think 4€ for a 180ml wine really expensive. Don't forget that it's low season and that MXP is 6 weekly in winter and from today it's daily. That's a lot of seats on offer so I guess they are making money in Milan. It's interesting they do so well even after Air One and easyJet failed. I suppose JU has a loyal following in northern Italy. A convenient schedule helps as well. 68% LF in March is fantastic for JU. Milan is generally expensive and not a good option for people continuing to other Italian cities. Low costers failed some years back but now Belgrade is much more popular so I hope Easy reintroduces flights to Malpensa or Ryan starts Bergamo (once they reach an agreement to start flying from Belgrade). 2/3 occupancy on a low season Thursday is not bad at all. 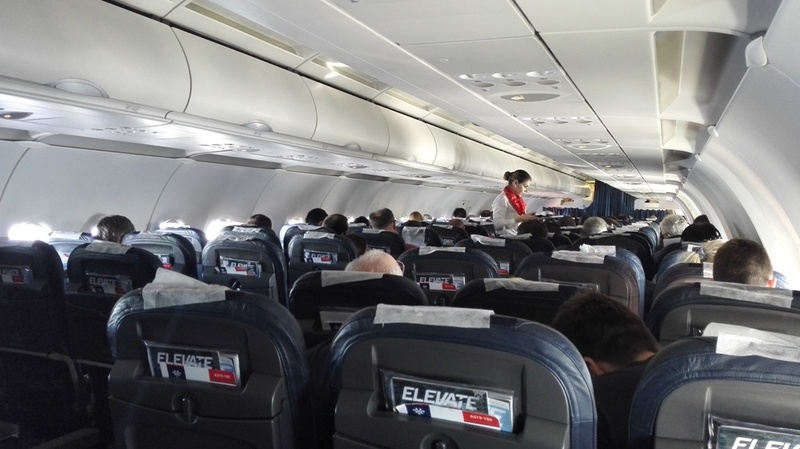 The only issue I have with experience on almost all Air Serbia flights is that they are too much like every other airline in Europe or US. Even the cockpit announcements which are welcomed and detailed are often rushed and frequently spoken in rather poor English. Crew announcements are better. I know the pilots have to repeat them million times, but most passengers hear them once or twice a year. 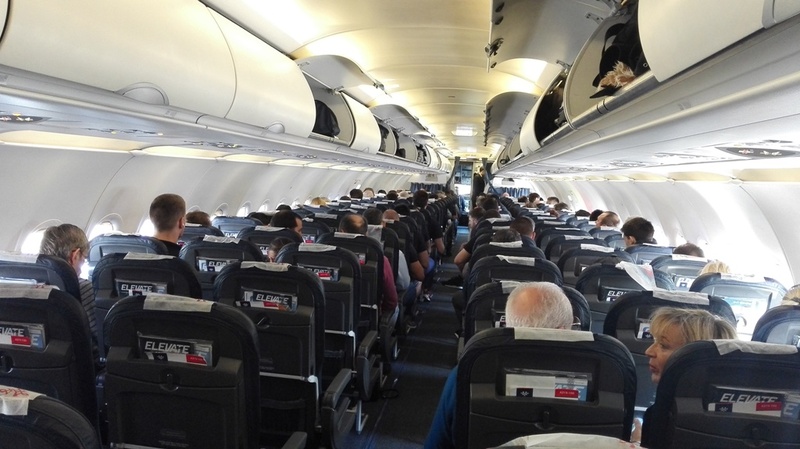 Even frequent fliers appreciate announcements for turbulence, some sort of human interaction. I would like Air Serbia to have something unique, something remarkable in terms of service. Bag of regular 15 salty fish-shaped crackers just isn't it. Well it depends on your ticket. For some you get complimentary sandwich and drinks. The main take away point is that there is always a 15-20 min delay wherever you fly with Ju ...something they seem incapable to fix and so is just because their schedule is based on flying time only and doesn't take into account airport delays, last minute gate closing or God forbids air traffic control delays. Huh? Not true, they add 20 minutes to the flight time. For example, LCA is schedule as 02.40 while the flight is rarely longer than 2.20. @Anon 19:48 Same anti-Air Serbia troll that keeps creating fake news and being allowed to spread lies. As nemjee said, JU schedules are padded to account for normal delays and JU has overall solid on time performance. Ex yu admin knows this, why would Anon at 19:48 be allowed to post this crap? Mr Namjee and Mr. Anon 23:10 start looking at Beg airport arrivals a little closer and all will be clear (I hope!). 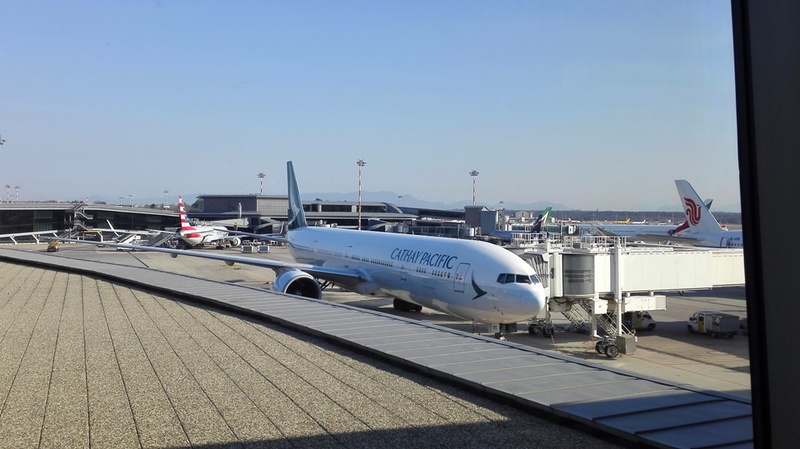 LCA and some destinations may have some padding but many DO NOT. Examples (LHR, SVO, FRA, AMS, FCO, CPH, CGD to name a few) and gents by the way these represent core destinations for any airline flying within Europe. What is more important a daily flight to LHR, SVO etc or a LCA flight that goes during the winter once a week!?!? 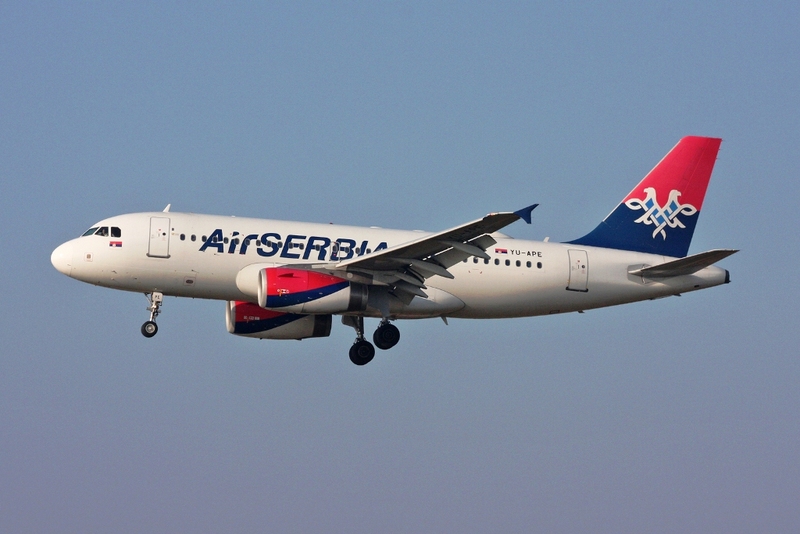 That is why Air Serbia should extend their flights to Croatias coast cities into the winter period . It definitely would improve JUs loadfactors on other routes like this one to Milano . At least wice a week with the Atrs to Dubrovnik and Split the coming winter season would be a starter . Their Rijeka flights should serve them as an example . Hi! My question is OT: How can I book their "Pre-order sandwiches" if I have booked my ticket to Dubrovnik, but I didn't do that at the time of my booking procedure. If I log into the "Manage my booking" section it doesn't show up that option to order sandwiches or muffin, just to buy some over priced cakes, or entry into their business lounges. Thanks in advance! "Air Serbia has launched a new prepaid hot meal service as of March 1, giving economy class passengers on flights lasting over eighty minutes the opportunity to preorder their food. " Do u know something about that? Is taht working? I guess you can both during the booking process or later on. Their sandwiches are actually quite good. Cool, good to see that JU is actually giving some free snacks and water at least. Last time I flew with them (BEG - PRG, Aug 2018) they didn't give any complementary food and you couldn't have paid with a debit card if you wanted to buy anything on top - they accepted only credit cards, which I found very strange and not to mention inconvenient. 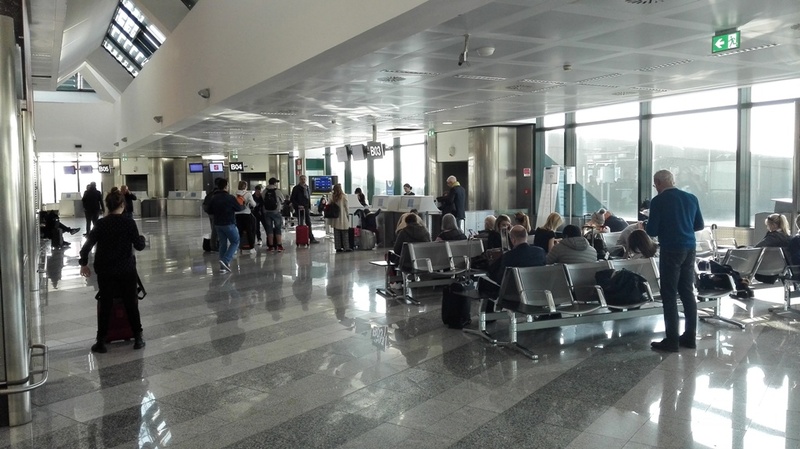 Moreover, Malpensa Terminal 1 looks great, much better than Terminal 2! I had same experience with debit card on Flydubai and i think AirBlatic, so this is not unique to AirSerbia. Issue is probably related to the way how the debit cards are working - in order for you to be able to pay, they must check your balance and then, if you have enough funds, you are allowed to pay (by card processor). I've just accepted that you need to have credit card if you want to buy onboard.